My father-in-law turned down beer yesterday because of the heat. Now that’s hot! Temperatures are soaring here in the Chicago area. We reached 102 degrees yesterday, with more 100 degree temperatures predictions for today and tomorrow. We kicked the day off as we do every year, sitting on the curb catching candy during the 4th of July Parade. 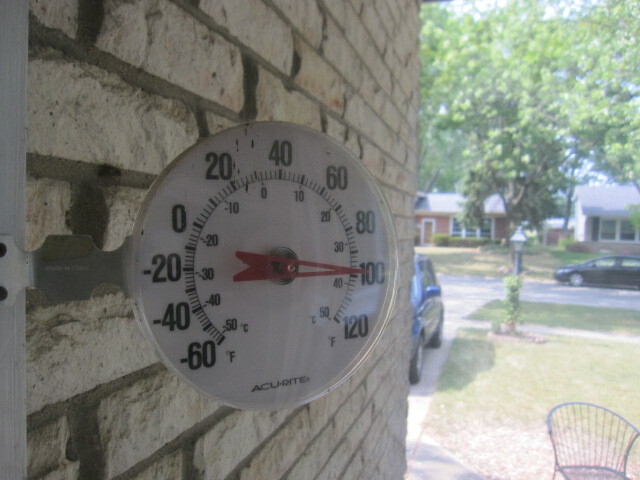 It was already sweltering at 9am. The best float was the big trailer with the pool on it, and the kids riding it had a ball splashing everyone sitting on the parade route. It was hot; so hot that Lily and Emmy decided we would skip the festival following the parade and go home to our air-conditioned house. Ed: Man, is it hot today. Emmy: (lying on my lap, which is the last place I want her to be) I’M HOT! Me: You know, without this breeze, it would be even hotter. Teenagers decide to play a game of bags. It’s hot. Emmy couldn’t stand the heat and had a hissy fit because the older people insisted on staying outside (it was the 4th of July, after all) until my brother-in-law suggested we turn on the sprinkler. Then, she happily got wet. The kids were not the only ones who used the sprinkler yesterday! Hot weather always makes me want a cold beer! Yes that kind of heat calls for a sprinkler day! Oh, it has been hot! We have had several days of 100 degrees around here. We've been staying inside, trying to stay cool, but the heat and being stuck inside has the kids driving me nuts… So today we loaded into the car to check out a McDonald's with a super play area. I'm shocked…where I live in Texas the high yesterday was only 98! We had a horrid heat wave last summer, so I definitely feel your pain. Hope you've found a place to stay cool today! We spent the day inside, and the evening at the pool! That's the way to do it when it's so hot! I definitely know what you are complaining about, we have more than 38 C degrees here in Europe (that’s about 110fahrenheit), and I couldn’t picture myself how I would suffer from it without any air condition. i'm in Chicago. this heat is horrendous. we never made it outside yesterday. And the heat shows no sign of stopping! Hope you're managing to stay cool today!